Israel is a land of miracles, mountainous, green and peaceful. Visitors are astonished to find most ethnic peoples getting along just fine. Amazement is evident when the fertile, green landscape is viewed and the result of reforestation of about 200,000,000 trees is enjoyed. Borders are still in existence, but it is more peaceful than ever before in modern history. The tops of the hills of Naphtali and the northern part of the Golan Heights border the now peaceful southern Lebanon. Due to the Lebanese civil conflicts and the anarchy of terrorism further north, southern Lebanon has become quite isolated. When Israel was proclaimed a state in 1948, many of the Arab people from the north of Israel settled permanently in this area, just north of the border of Israel. Recently, thousands of these same Moslems and Christians have come back across Israel’s `Good Fence’ for medical aid and to shop for basic necessities. There are hundreds of Lebanese that regularly work in Israel, some even drive their cars, specially licensed, back and forth across the border. The challenge to drain the ancient, stinking swamps called the Hula, was met by new Jewish immigrants in the 1940’s and 50’s. The land is now fruitful. 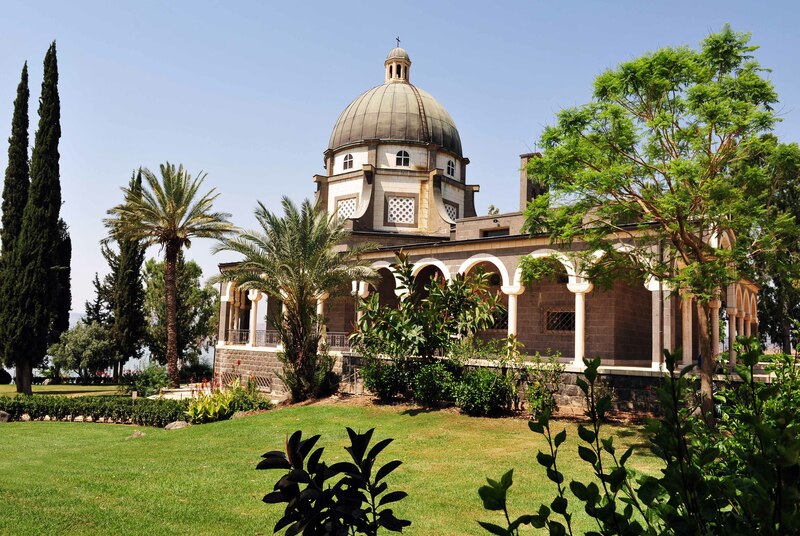 Many of the returning Lebanese visitors are surprised to see the new landscape which has changed considerably since they last saw it almost forty years ago. New settlements and development towns like Kiryat Shemona dot the fertile countryside. Much of this fertility comes from the luscious nature preserve bursting forth with springs, trickles and bubbling brooks. The three sources of the Jordan River that come together are from the Lebanese mountains, the Mount Hermon, (Banias), and the springs of Dan. A walk through the Dan area is like a stroll in the Garden of Eden. The waters depart from the ruins of the tribe of Dan and combine with the run-off from Mount Hermon, then flow down to the Sea of Galilee. The Hebrew word for going down is “yored”. Some people feel that the term or expression “yored – Dan”, is the origen of the name Jordan, (even though Joshua crossed the Jordan River before the tribe of Dan had settled in this northern area). The name “Banias” is derived from the name “Paneus”, meaning a place (and resort) where the mythological God Pan was worshipped. Incidentally, in mythology, the god Pan was responsible for nature and vegetation. The Roman held pagan worship activities in this incredibly verdant area. Phillipi built by Herod Philip. Here, Jesus asked his disciples, “…Whom do men say that I the Son of man am?” and then “…whom say ye that I am”. Simon, son of Jonah, (Bar Jonah in Aramaic means the “son of your father Jonah”), said, “…Thou art the Christ, the Son of the living God”. Jesus responded to Simon by calling him Peter, (Petrus in Greek), a rock, then most likely indicating the massive rock, reminded Simon Peter that flesh and blood had not revealed it to him but that his Father in Heaven had. (MATTHEW 16:13-19) The dialogue, with words from several languages, seems to be a lesson to Simon Peter (Rocky in very modern English) that there is a difference in perceiving things by man’s (flesh and blood) understanding as compared to that which comes through revelation from his Father in Heaven. A sure way to recognize the Messiah, the Son of the Living God, is with the rock of revelation. On Mount Hermon, in the Golan Heights, are several villages of Druze, a people claiming to be descendants of Jethro, the father-in-law of Moses. Their industrious nature and secretive religious functions, customs and traditions make them an unusual and colorful people. They are an integral part of Israel’s modern population, serving in government and military positions. Some speculation suggests that the Druze may be much like the ancient biblical Kenite people, who unlike the Canaanites, were loyal to Israel. (1 SAMUEL 15:6) Modern archaeology seems to indicate that the Kenites practiced similar Israelite religious customs and even built their temples like the temple of Israel, (three courtyards, holy of holies, horned altar, etc.).. Since 1967, the Golan has become a peaceful place as Israelis have cleared this rocky land, discovered great farming soil as well as new water sources. 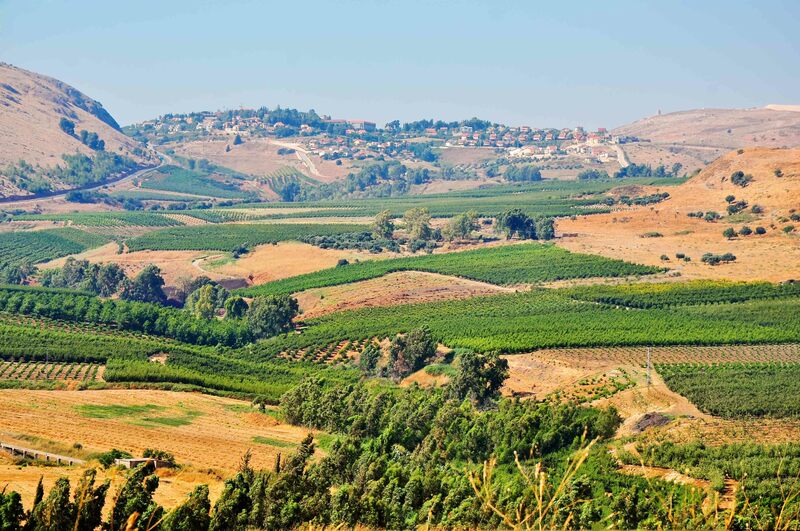 The unique combination of rich volcanic soil and modern farming techniques have produced outstanding agricultural yields including award winning grape and wine production for modern Israel. Close to sixty different ancient Jewish sites, dating to the 3rd, 4th and 5th Centuries after the time of Jesus, have been found as new Jewish settlements were established. During the beginning decades of the modern State of Israel, the Syrians used the Golan Heights to shoot at Israeli settlements and swamp clearing operations in the Hula Valley below. In the 1967, six-day war, the Israelis moved the Syrians off the western side of the heights and to the Eastern low lands on the other side. Since then, on the Israeli side, the Hula valley and the Golan above it has become fruitful. The Golan was inhabited by Israel (tribes of Dan, part of Manasseh and some Levites) in Old Testament times as well. (JOSHUA 21:27) Most of the New Testament accounts occurred in the Golan/Galilee area. In recent times, excavations have uncovered the ruins of a once thriving city of Romans and Jews. 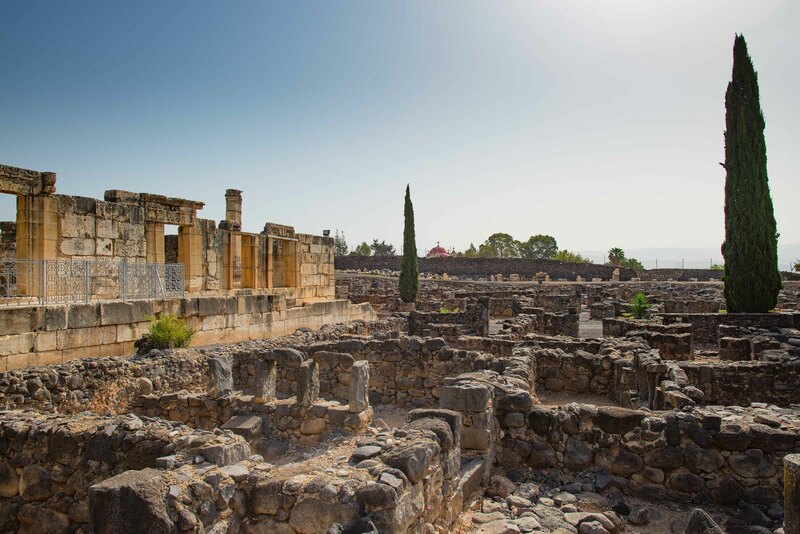 In ancient times, Capernaum may have had ten thousand inhabitants. It was a Roman toll station. It seems that a toll-taker challenged Peter for toll on his guest, Jesus of Nazareth. Peter apparently offered to pay it, but Jesus begins a significant dialogue, “What thinkest thou, Simon? of whom do the kings of the earth take custom or tribute? of their own children, or of strangers? Peter saith unto him, Of strangers. Jesus saith unto him, Then are the children free. Notwithstanding, lest we should offend them, go thou to the sea, and cast an hook, and take up the fish that first cometh up; and when thou hast opened his mouth, thou shalt find a piece of money: that take, and give unto them for me and thee. (MATTHEW 17:24-27) Graciously, Peter offers to pay the tribute for Jesus (which actually was unnecessary). Jesus, even more graciously, has Peter catch a fish which contains a coin in its mouth of large enough value to pay the toll for both of them. Some other of the better known miracles that happened at Capernaum include a palsied man being lowered through the roof on his bed so Jesus could heal him; healing a man with a withered hand; healing Peter’s mother-in-law; having Peter catch fish on the other side of the boat; healing the centurion’s servant from a distance and many others. Religious Jews today wear a garment of wool called a talith, the name seems to be derived from the Hebrew word for lamb, “taleh”. The hem or the strings of the talith are customarily touched during Jewish religious services, (the four sets of strings are knotted so that the sum of knots and strings equal 613 – the number of laws and covenants including the ten commandments, given to Moses on Mount Sinai). The woman who touched the garment of Jesus (probably the talith) was healed. When he questioned who had touched him, the women fell at his feet and confessed, probably because it was totally against Jewish custom for a woman, bleeding (ritually unclean), to touch anyone. Jesus assured her that her faith had made her whole. TALITHA – The reflections of a little girl. but, I liked him right away. will you sit with me today? …and he taught me how to pray. When I was sick, he came to me. but, my life had slipped away. Have faith, he was heard to say. Talitha, rise up and stay. The Sermon on the Mount was apparently given to the Twelve, “And seeing the multitudes, he went up into a mountain: and when he was set, his disciples came unto him”, (MATTHEW 5:1), yet it invites all people, whether rich or poor in spirit, happy or mourning, popular or persecuted, to come unto him. He promised that they would be filled with the Holy Ghost if they would accept Him. Jesus indicated that the Law of Moses was fulfilled in Him, that he was restoring a higher law, one that was governed and dictated more by the spirit and intent than by the letter of the law, which was given at Mount Sinai, (after Moses had destroyed the first set of tablets). A better understanding of the Sermon on the Mount comes when comparing it to the commandments given on Mount Sinai. A closer look at the “Beatitudes” also reveals that Jesus gave additional commandments. They were based on the original “Law of Moses”, but had deeper spiritual implications, implying that the reason behind keeping the commandments was more the spiritual guideline than the “letter of the law”. The law was given, the standard set. But, best was not accepted yet. Just ten commandments was our choice. inwardly, God would speak to you. a higher law on us was sealed. As you and He become much nearer. when action by intent is shown. Use thought and reason to guide the way. in thought, in spirit and in the mind. As stated before, the two sets of law form a chiasm around the ministry and atonement of Jesus. Fifty days after His crucifixion at Passover, the Holy Ghost came upon the congregation in Jerusalem. The Jewish Holiday commemorating the giving of the “Lesser” Law at Mount Sinai is also celebrated fifty days after Passover. Apparently, the same day was used in giving the gift of the Holy Ghost, the “Higher” Law. (ACTS 2:1-5) The day is called Pentecost. 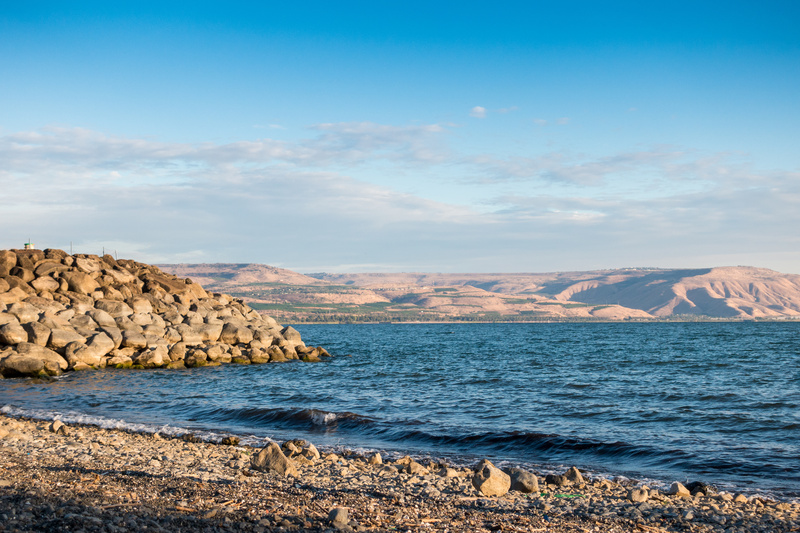 After the resurrection, the Savior appeared to the Apostles at the Sea of Galilee. They had been fishing all night — and had caught nothing. He told them again, “…cast your nets on the right side of the ship”. (JOHN 21:6) The two stories of catching fish, one at the beginning of his earthly ministry and the second after his earthly ministry is another chiasm. The savior’s atonement is again evident as the center subject. The first time the Disciples were told by Jesus to cast their nets on the other side, the nets broke, they were not able to harvest the fish. Three years later, he told them the second time to cast on the other side, this time the nets held together and the Disciples pulled in the catch. A symbolic consideration could be that their three years of training with the Master was to teach them how to be successful fishers of men. After the resurrection, as they successfully pulled the nets in, Jesus bade Peter and the others to eat with him. Jesus, then asking Peter three times if he loved him more than the fishes, kept reminding Peter, “…Feed my sheep”. (JOHN 21:1-17) Jesus’ role is to save, the Apostles role is to feed the sheep. It seems that once the Twelve had learned that relationship, they were able to more successfully teach, effectively bless and divinely save; because now, they were not trying to do things from themselves, but were truly working in the name of Jesus. It is his name upon us that is a constant reminder of the miracle of life eternal. He blessed, he saved, he restored. Modern Israel is a witness of the power of restoration of the land and of the people. The miracles of old are reflected in a now new land of miracles.